I didn’t realise how tiring a 3000-mile play around alpine roads could be. It’s a tough life! 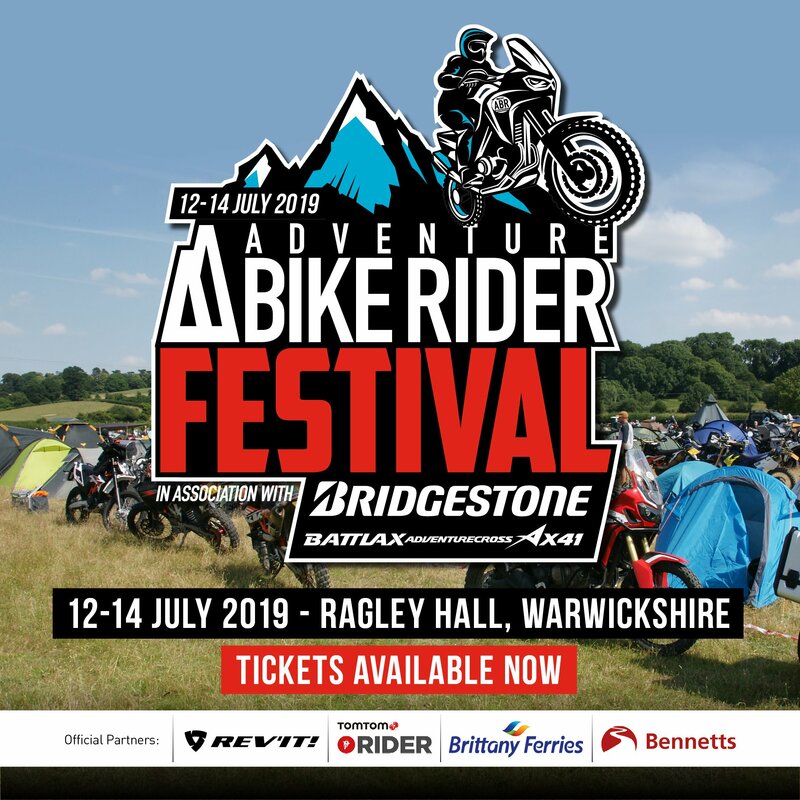 Mind you though, it did mean that a couple of days winding down gave quiet opportunity for reflection, both on the scenery and how the bikes ran, in particular the ‘Bat Bike’ as Alun calls the KTM 990 Adventure. I have to say that suffering with a clutch problem again was annoying to say the least, especially as I was on top of a mountain pass with miles of beautifully winding roads ahead of me. I lost pressure on the lever as if the reservoir had emptied. Foolishly, I forgot mineral oil so I couldn’t fashion a Bodgit & Scarper Ltd repair, but after an hour or so the pressure returned. The KTM 990 Adventure is going to a dealer next week for a service and an explanation. 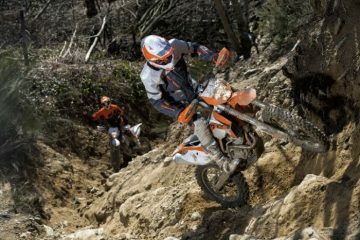 There do seem to be some clutch issues on the KTM forums and discussion boards. Let’s hope it’s one of the simple solutions, I don’t want a second big bill as I’ve already had a master cylinder service kit fitted. 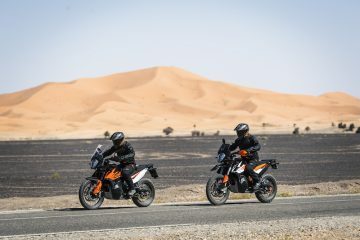 I agree with Alun in the sense that the KTM 990 Adventure does seem to be, let’s say, more highly strung than the Triumph Tiger and BMW F800GS, it ran hot quickly in slow traffic and I’m going to see if this is a general characteristic. I’m glad I had good gear on as my right leg was never going to be cold from engine and exhaust heat. I also found that whilst the others could quite happily cruise at lower speeds in higher gears, the KTM 990 Adventure prefers to only run in top at higher speeds otherwise you become acutely aware of the (literally) thumping V-twin under you (extra payload considered). All that said, I loved it. It does need to be ridden more aggressively with its racing heritage and I’m sure that a couple of the photos with the foot down around mountain switchbacks will only prove how much fun I was having. Ridden well, it is incredibly responsive and just dives into bends with your weight forward and then opening up the throttle leaves you holding on. The torque is immense and the one positive to come out of having a clutch issue was to improve my riding so I didn’t have to change gear as frequently and use the engine more efficiently. This was better for fuel consumption too. 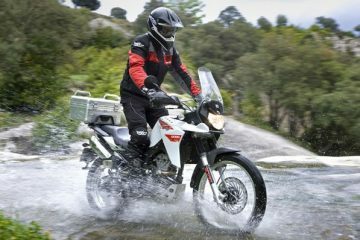 The Triumph Tiger and KTM 990 Adventure were fairly similar, having the reserve light on at about 150 miles, though Spencer’s BMW F800GS must have been fuelled by Plutonium, having a much greater range. Fairly obvious considering a smaller engine, but this in no way meant it was underpowered or lacked handling capability and this was despite Spence trying to get more luggage on than a UPS van. 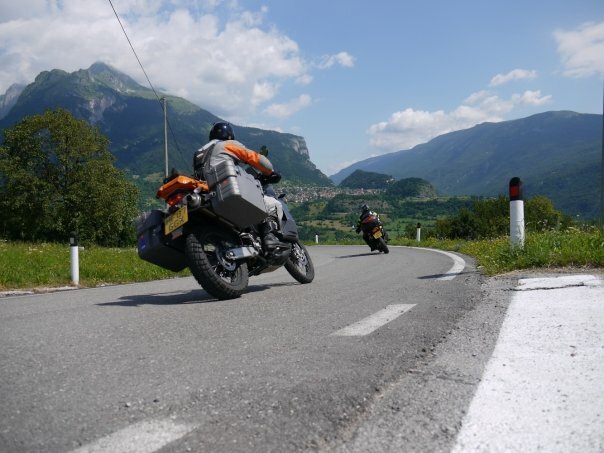 A note on carrying luggage – with the side panniers there was a strong speed wobble that began almost immediately on deceleration. I checked that I had equal weight distribution and tested again and sure enough it reappeared. There is also a slight wobble during lower speeds on acceleration and cruising. Something to investigate further. 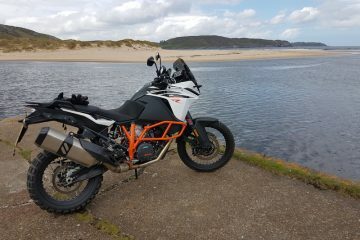 Out of necessity, I had a my first real taster of how the KTM handled off-road after a dose of poor judgement forced me to take a rapid ‘stage exit right’ up a mountain track before rejoining the road. Impressed and grateful of it’s ability. 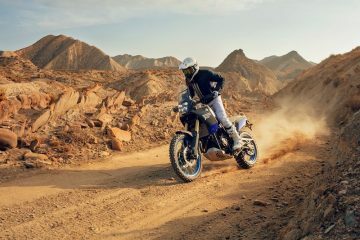 I would like the next trip to have more off-road and enter into the spirit of a real adventure. I just need to sort that clutch out. 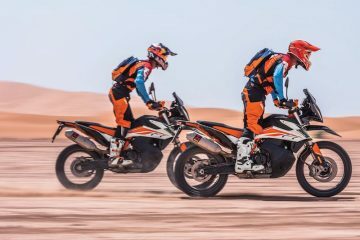 If anyone out there with a KTM 990 Adventure has had similar issues, please post up a reply. 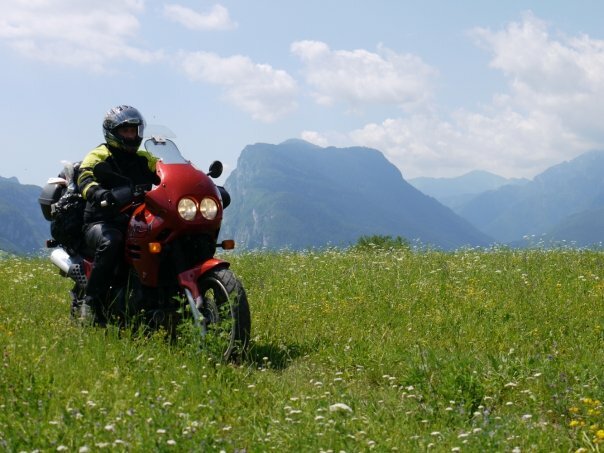 Just one more thought, as anyone with an adventurous soul will tell you, as long as it has a running engine… any two wheels will do. These guys had been everywhere, no idea how old the BMW was, but it had seen action, and lots of it! Next stop was Scotland.